If you want a simple and affordable product that can make your vape pen more secure while looking great at the same time, then our vape bands are the perfect choice. Wrapping securely around your equipment, they can act as a shock absorber, and protect it if you drop it. 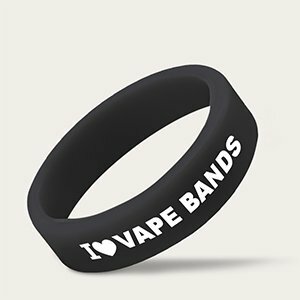 Vape bands are both beautiful and useful. We, at AmazingWristbands.com, create trendy high quality silicone rings that can be customized with our easy-to-use online customization tool. We will help you design your product exactly the way you want. Your vape bracelet can also double up as a personalized silicone thumb ring; a small, simple product which can also double up as a fun fashion statement. If you're also looking for some well-made texting thumb bands that can be fully customized to suit your needs, you're in luck, because you'll be spoilt for choice here at Amazing Wristbands. When it comes to customizing your vape or thumb bands, there's plenty of choice, so as long as your chosen design fits on our 1/2 inch standard, or 1/4 inch thin rings, we're confident we'll be able to deliver it. Show your love of vaping, or just choose from our 6 color swirls or 7 color segments. We've got one of the largest color selections in the industry, as well as over 300 fonts and 1000+ clipart designs. You can also decide on a debossed, embossed, or screen printed finish. We have 1/2" standard rings and 1/4" thin rings for you to choose from. We have one of the largest color selections in the industry. You can also choose custom colors based on the Pantone Color System. And if you really want to shine with your beautiful ring, we suggest you make it unique with different swirled or segmented colors. We have up to 6 color swirls and 7 color segments. Use our online customizer and choose your favorite custom colors. Our sales team will even color match for you. Debossed: Gives a sunken in effect and the message color will be the same as the ring color. Ink filled debossed: Same as debossed but you can have a different message color to highlight your message. Embossed: Raised in or Pop up effect and the message color will be the same as the ring color. Colorized Embossed: Same as embossed but you can have a different message color. Screen Printing: Normal printing effect and it is perfect to print complex logos. Any message can be placed on the rings depending upon the width. We also have a 2-line feature where (as the name suggests) you can have your message printed in 2 lines. We have over 300+ fonts and 1000+ cliparts to choose from or you can send us a custom clip art or font. You can have your rings glow in the dark, by selecting our glow feature; you can also add glitter for a fun effect. We offer small, medium and large; you can also speak with our customer care agents to get an idea about the perfect size that fits you. What Can You Expect from Amazing Wristbands? We are a leading provider of customized silicone rings available online. Since we have wonderful web reviews and trustworthy profile listing in social media, you won't have to worry about online scamming or frauds. Experience the difference at Amazing Wristbands! Call 1-800-269-0910 to speak with our customer care agent or Email us at customercare@amazingwristbands.com. Like the sound of our versatile, affordable products? Use our handy quote page to see what can be done, and how much it will cost. We are happy to have your order placed with us! !